Four changes from the starting XI that had lost in stoppage time the previous Saturday at Oxford United. Defeat to Portsmouth extended Wanderers' winless in the League to 11 games and left them in 19th spot in the table - now just a single point above the relegation zone. Wanderers' situation could have been worse if not for late goals in other matches involving the relegation threatened sides. Southend, the only team on a longer winless run than Wycombe, were leading at Fleetwood Town with six minutes of normal time remaining but conceded a penalty to eventually draw 2-2. Rochdale also remained in the bottom four but took a surprise 28th minute lead at home to Sunderland before conceding an equaliser on 56 minutes and then an 89th minute to lose 2-1. Walsall were leading at home to Oxford United but eventually lost 3-1 to also remain in the bottom four. Form team Wimbledon drew 1-1 at home to Accrington. 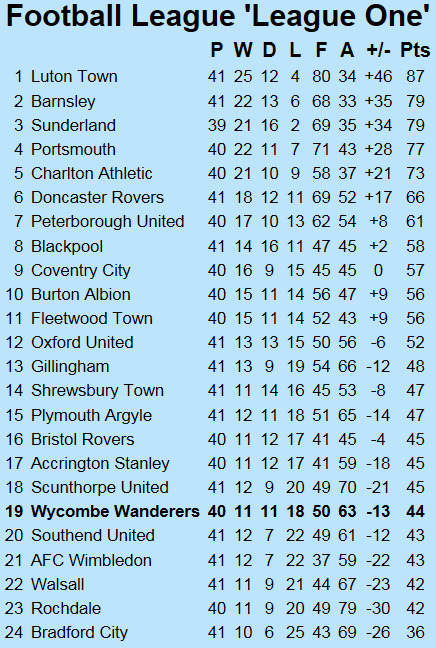 Wycombe host 5th place Charlton Athletic on Tuesday (9th April 2019). A win could potentially lift Gareth Ainsworth's side to 15th in the table ahead of the visit ti Southend on Saturday (13th April 2019).